susan is a local floral designer, artist and instructor who creates unusual, boundary-pushing floral art including elaborate headpieces, flower crowns, and her signature succulent jewelry. her soulful, seasonally-inspired creations and floral wearables have been described as exquisite living artwork. 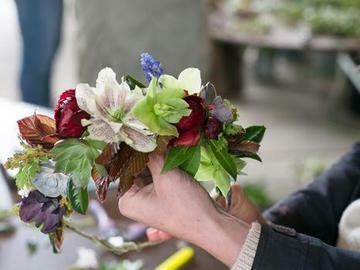 participants of the workshop will receive instruction by susan mcleary to create a flower crown. all materials are included, and all skill levels are welcome. this is a separately ticketed event, priced at $85, you must also purchase a day pass to enter the DWF main space to attend this workshop.